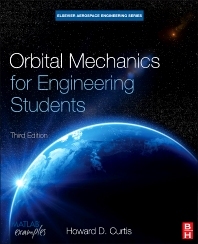 Written by Howard Curtis, Professor of Aerospace Engineering at Embry-Riddle University, Orbital Mechanics for Engineering Students is a crucial text for students of aerospace engineering. Now in its 3e, the book has been brought up-to-date with new topics, key terms, homework exercises, and fully worked examples. Highly illustrated and fully supported with downloadable MATLAB algorithms for project and practical work, this book provides all the tools needed to fully understand the subject. Undergraduate students in aerospace, astronautical, mechanical engineering, and engineering physics; related professional aerospace and space engineering fields.